Good morning! As the temperatures continue to drop here in the northeast it gives us the perfect excuse to curl up with the latest edition of everyone's favorite photography newsletter. Enjoy! I just love this story. 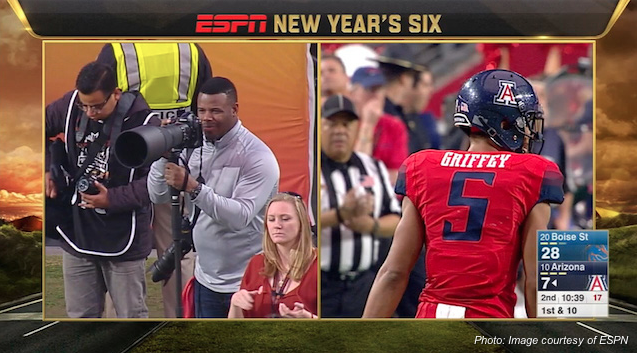 How cool would it be to line up with your fellow photogs on the sideline to shoot a game and look over to see Ken Griffey Jr. doing the same? Just the idea that a guy who can probably do anything he wants in his free time decides to spend it as a sports photographer is very heartwarming. The winter months present their own challenges on our creativity, but this post by Nancy Young should give you more than enough to do to climb out of any ruts you may find yourself in. If you're looking for some photographic inspiration for the coming year look no further than these great quotes from the masters of our craft. I'm a sucker for simple lighting setups, and this tutorial from Joel Grimes certainly fits that bill. It's true we may not all have a huge diffuser kicking around, but the overall theme of doing more with less definitely makes this video worth watching. Taking photos in the winter has its own set of issues to deal with. First of all, snow is white, not blue, although blue is what the camera thinks if you have it set to AWB. Luckily, we can correct this in Photoshop as the folks over at Fstoppers show us. New gear always brings questions, and the same is true for the new mirrorless cameras. Luckily we have people like Brian Matiash who are willing to offer useful tips when considering the move to mirrorless. The timing it takes to capture some wildlife photos always impresses me, which is just one of the reasons I love this awesome shot by Vadim Trunov. Taylor Swift's new album '1989' has been climbing the charts and the latest single from that album, 'Blank Space' is getting plenty of airtime on radio stations everywhere. If you've heard that song and thought to yourself, "I wonder what this song would sound like if it were about photography? ", wonder no more! James Taylor Shores gathered up some friends and put together a very well done version of this song for all the photographers in the crowd.